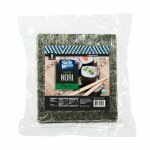 Kosher Roasted Sushi Nori Silver- 50 Full Size Sheets [NORSFS] - $12.99 : SushiMaven.com, Your Source For Everything Sushi! 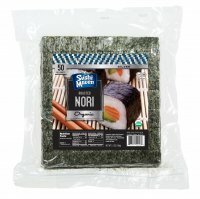 These nori sheets have a sweet ocean-like taste. Already roasted ("yaki-nori" in Japanese), Nori sheets are ready to roll for sushi, nori rolls, and rice balls! It is also a common garnish or flavoring in noodle preparations and soups! Seaweed is a remarkably healthy food. Low in calories and containing balanced nutrients such as protein, calcium, iron, vegetable fibers, and various vitamins. 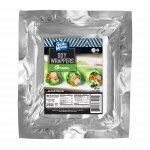 Based on the color, aroma, texture and taste, the Premium Silver Quality Yaki Sushi Nori is known to be of the highest quality kosher Nori you'll ever find! 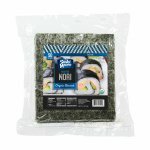 Since Nori can get ruined when exposed to humidity, it's packaged in a moisture-proof resealable bag. Once the package is opened, make sure to remove all the air before closing it. And remember, it is always better to eat Nori soon after the package is opened.